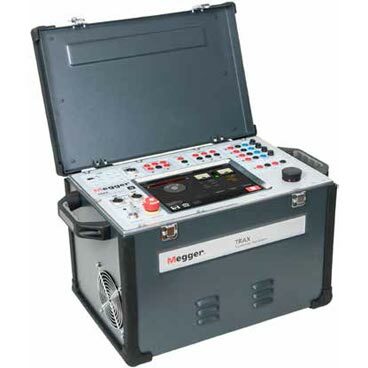 TSX 303 is an accessory to TRAX that enables automatic testing of all phases and taps of a transformer with only one single connection of test leads. This eliminates the need for reconnections between tests and greatly reduces the time needed for the full measurement procedure. Safety is also improved as the number of trips up and down the ladder to transformer is reduced to only connection and disconnection of the bushing cables. Typically, the TSX 303 automatic switchbox is put on top of the transformer and connected to the TRAX, which stays on the ground, with three 10 m long cables. Connection to the transformer is done with a set of eight color coded bushing cables, 9 m in length. The bushing cables are fitted with Kelvin clamps and XLR connectors for further ease of connection. 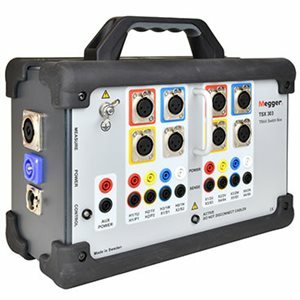 All necessary cables are supplied with the switchbox in a soft compartmentalized case that can be carried either as a backpack or as a shoulder bag. For a customer who already own a set of bushing cables, the TSX 303 can be used also with banana connector leads, something that is also useful in the event of a damaged cable; any bushing cable can be used as a replacement.